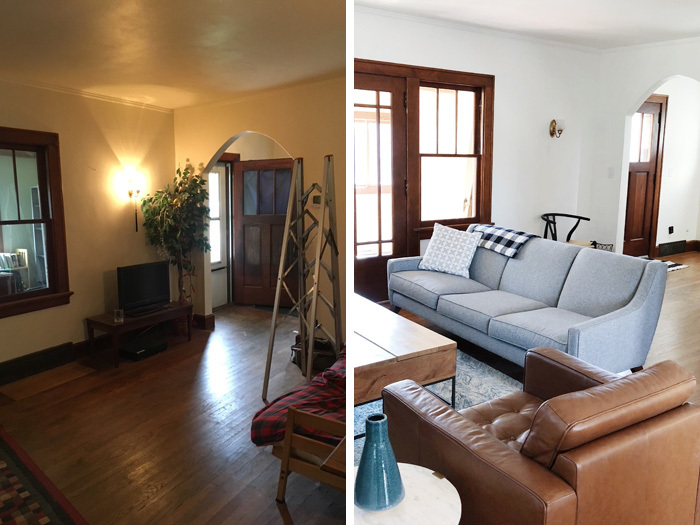 We still have work to do in our living room in terms of accessorizing and styling, but I thought I’d give you a peek into where things are at right now compared to when we did our inspection in May. Obviously the before photos are on the dim side and that’s not an intentional editing choice to make you think it’s worse than it was. It was really that bad. Most of the light bulbs were partially unscrewed so they wouldn’t turn on and just about every window in the house was covered by fabric (men’s shirts and old sheets rather than window treatments). The paint was this awful creamy color that wasn’t quite as yellow in the images below, but it was as dingy and soul sucking as it appears here. 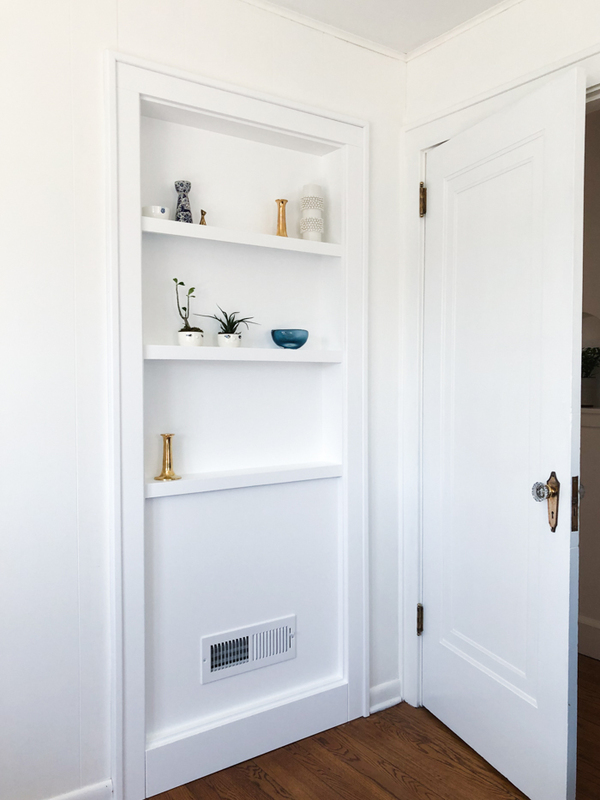 The first thing we tackled (after removing kitchen cabinetry from the guest room and a random square of teal carpet in the coat closet) was repairing cracks in the plaster walls and painting as much as we possibly could before we had our floors refinished. 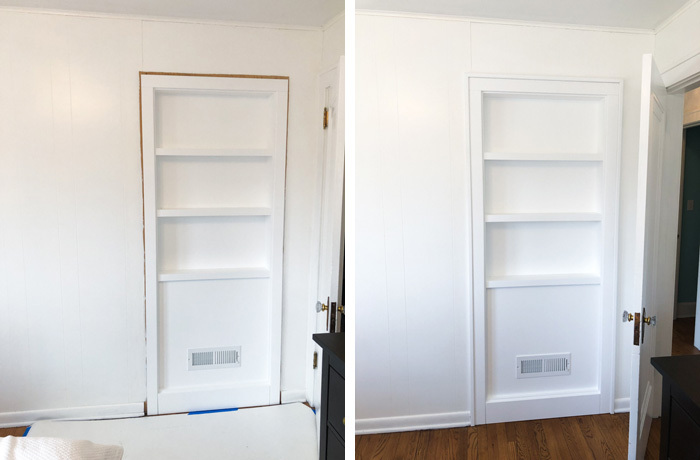 We got through the living room, dining room, the wood-paneled master bedroom and office, the guest bedroom, and the tiny room that eventually became my closet. The far wall in the staircase was left unpainted at the time because I’d like to wallpaper it. I didn’t want to spend the time painting something I was just going to cover up eventually. 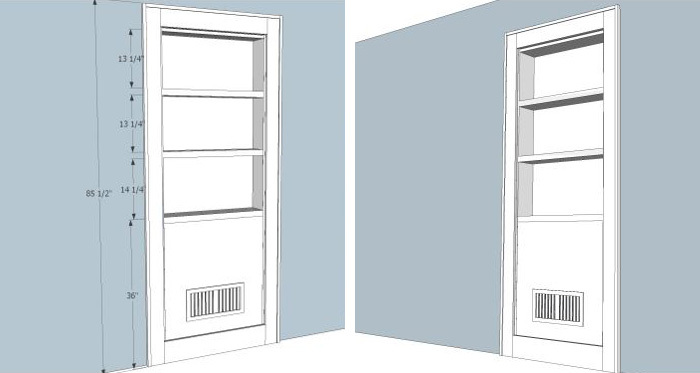 At this point, though, we’re leaning toward painting it white and doing wallpaper next year. It’s such an expensive project and we have other priorities to take care of. 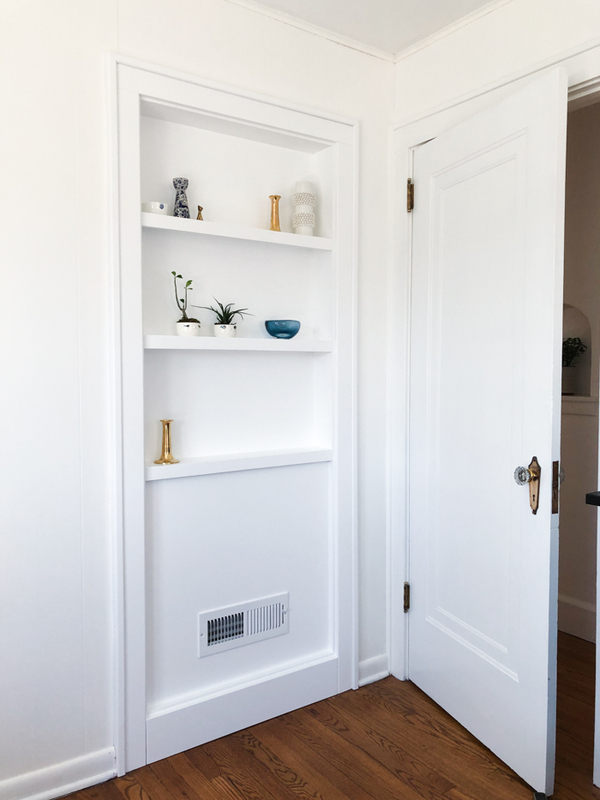 However, painting everything else white and removing the window coverings opened up the space and made it feel brighter and more welcoming, so the cream wall doesn’t bother me too much at the moment. My plan is to paint the upstairs hallway, ceiling, and trim this month and get to the top of the stairs. We’ll hire someone to finish up the stairwell since I’m not graceful enough to stand on a ladder while I paint. We have pretty high ceilings there and I have no doubt that I’d fall or get paint all over the stairs. Replacing the sconces is next on the to-do list for the living room. 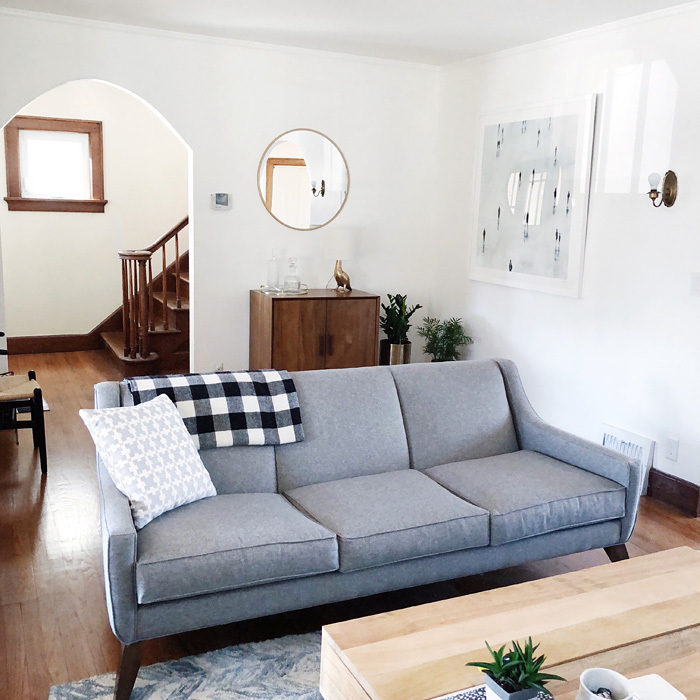 We’d also like to find a better throw pillow, a larger rug, and redesigning the corner that we have that wood chair in the photo above. The side chair is great for putting on shoes and using for additional seating. However, a mid-century modern bench might fill the space better. I’d also like to find artwork to hang in that area. All that stuff is easy, though, and will fall into place as we find the right pieces. 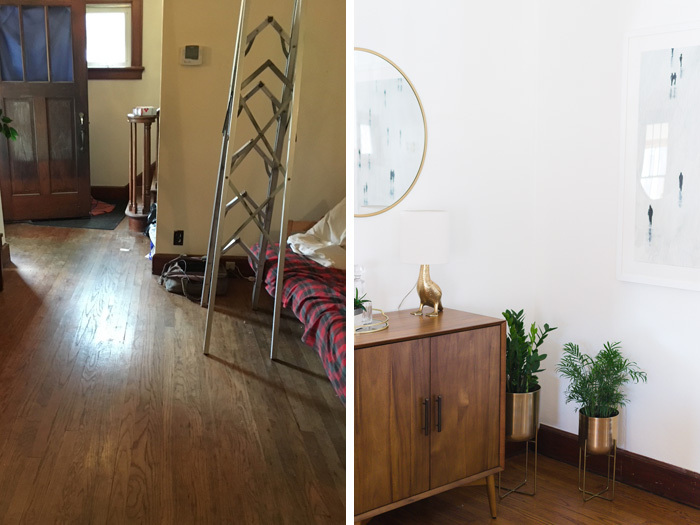 I don’t want to push anything and accidentally have our house look like the 2017/2018 West Elm catalog because I was too impatient to wait for the right item. 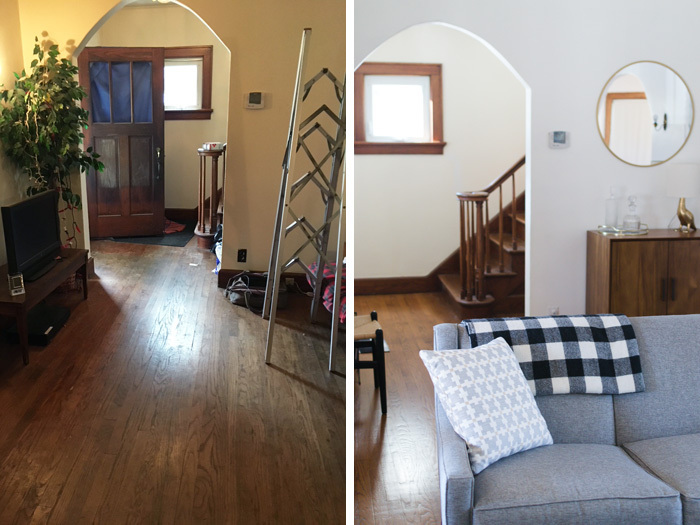 Now that the living room is in a good spot, we’re talking about what room to embark on next. It’s a toss up between the dining room or kitchen. The dining room is definitely easier and really just requires furniture, a woodworker to fill in spots were the trim and crown molding is missing, and window treatments. The kitchen is a more adventurous project. 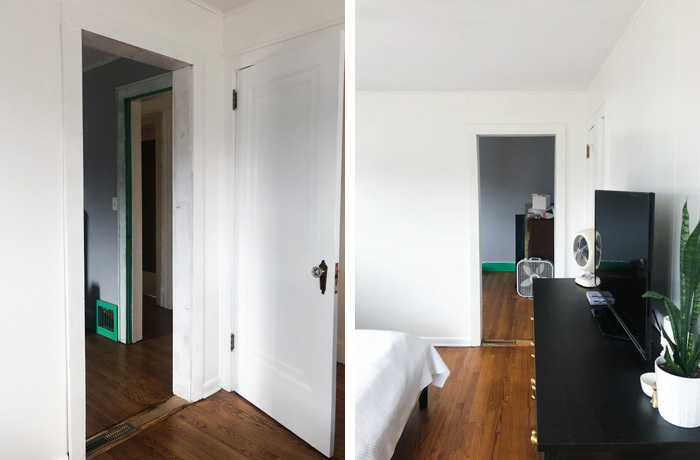 It’ll all be cosmetic updates and not a true renovation, but there’s a lot to do in that room from skim coating the textured walls to replacing the linoleum flooring that has a gross river rock design.